​It's a mix of good news and bad news for Alabama fans. QB ​Tua Tagovailoa reportedly has been dealing with a sprained knee all week, but has still been able to take every rep in practice. An injury to a ​Heisman hopeful is never good news for fans of the team he plays on, but the fact that he's been able to still practice through it is a great sign. As of right now, it looks likely that Tagovailoa will play this weekend against Missouri. ​​Tagovailoa is arguably the best QB Nick Saban has ever had in his tenure at Alabama. 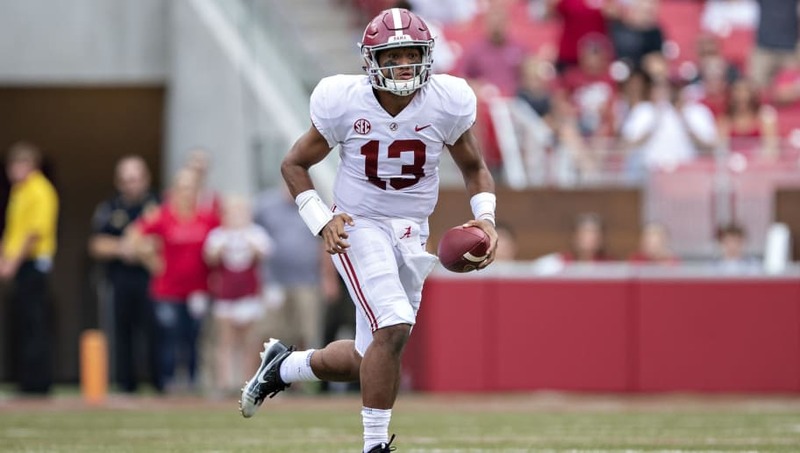 The superbly talented sophomore has taken the college football landscape by storm in his team's first few games, putting both the Crimson Tide and himself at the forefront of the national title conversation. Hopefully, Tagovailoa won't further aggravate his injury in practice this week or worsen it during Saturday's game. The country wants to see more of this exciting 20-year-old going forward. Any injury news on his front is scary but as of right now, it looks like Alabama fans shouldn't worry too much. Of course, that could change at any second.